Rocket City Mom is one of your top favorites sites. 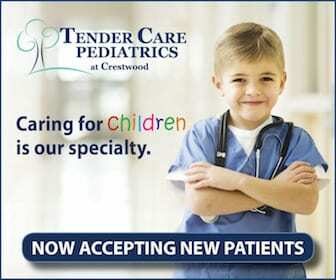 You’re savvy about community activities. You take your kids to the playground. You try to balance their time in front of a computer or on an electronic gadget with opportunities to build imagination and muscles in outdoor play. So, let’s go outside and go on a hike. Ewww… You Want to Go Hiking? I get it. Some adults and kids hear “hike” and it conjures thoughts of heavy boots, bugs, and poison ivy. Lots of sweaty uphill climbs and sore muscles afterwards. 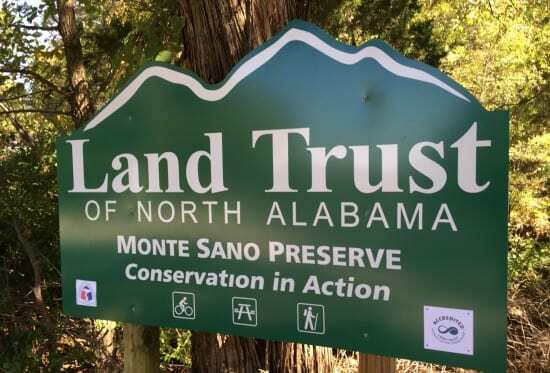 The Land Trust of North Alabama has some lovely spots and trails to help you get your adventure on, get the wiggles out, and slip in a bit of exercise like you slip veggies into mac & cheese. I’ve listed some of my favorite hiking trails for kids below to make it easy for your family to enjoy them. NOTE: As with any natural area, in the warmer months there are snakes (who don’t want to be anywhere you are so make lots of noise) and woodland inhabitants. We encourage you to stay on the trail, be able to identify poison ivy, and carry out any trash. 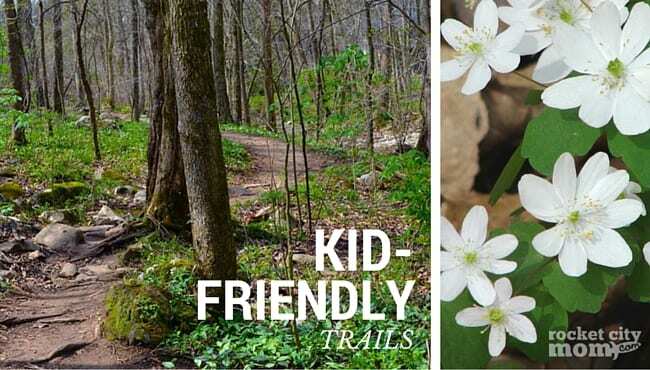 Spring brings carpets of wildflowers to this little gem of a trail on the Monte Sano Nature Preserve. Shy Mayapples under their umbrellas, dramatic Bloodroot, and little pockets of Virginia Bluebells add color before the trees leaf in and the wildflowers go dormant for another year. The major show of yellow Trout Lily is always beautiful. Since it takes up to7 years for these plants to flower, the large colonies of Trout Lily on this trail are very mature. Wildflower Trail runs beside Fagan Creek. The beaten path has exposed rocks and roots so closed-toe shoes are a must. Dogs should be on leads on all Land Trust properties, please. After rain when the creek is running, the water is clear enough to find indicator species such as crayfish and tadpoles, both of which signal the good health of the stream. A slow amble along the trail is perfect for young children. There are memorial benches along the way to sit and enjoy a snack. Birds and butterflies love this area. Bring extra footwear in case splashing in the creek becomes irresistible. Later in the summer when the creek bed is dry you may find fossils and interesting rock formations. 25+ miles of public trails. 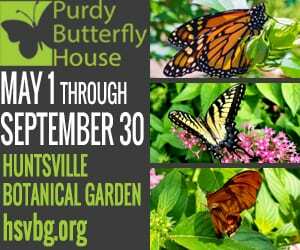 The Nature Preserve is the scenic frame for the city of Huntsville (that green, undeveloped side of Monte Sano you see from downtown) and is the home of what remains of the Monte Sano Railway, historic Three Caves Quarry, Civil War landmark Trough Springs, and popular Wildflower Trail. The primary trailhead is just off Bankhead Parkway and the green logo sign is hard to miss. 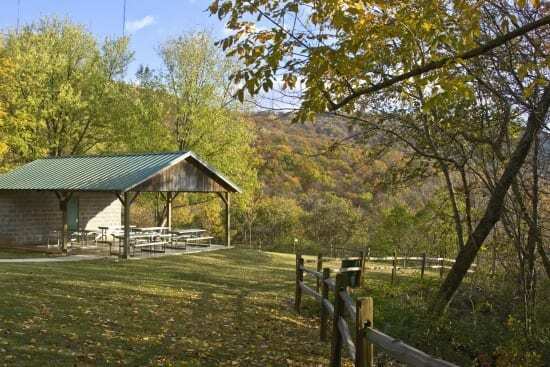 Many of our most well known trails are accessed from this hiker parking lot trailhead. You could start your outdoor adventure with a picnic at the environmental education pavilion, then let the kids run and play on the pavilion lawn. The Old Railroad Bed Trail is a bit of Huntsville history dating from 1888 to 1896. You might walk to the first wooden bridge to see the stone foundations that were quarried and placed with no mortar or cement. These stone foundations remain intact after enduring 125+ years of weathering and provide the most visible record of the railroad. The trail is marked with interpretive signs. Take a little 20 minute ride from University Drive up Highway 53 (Jordan Lane) and turn at the light (Jeff Road) toward the Publix Market. Just past Publix is our youngest Nature Preserve. 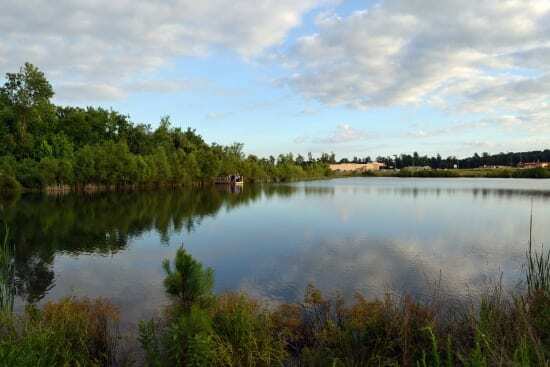 Harvest Square is a 69 acre oasis which features two naturally stocked ponds, the Dale W. Strong Community Pavilion for picnicking, and 2.3 miles of flat trails for exercise and enjoyment. It is truly an island of serenity. After lunch at the pavilion, you may see ducks on the ponds or walk to the mini dock to try your luck at catching a bass. You’ll need to have a fishing license and don’t forget to catch and release, please! Plans are underway to make some of the Harvest Square trails into the Land Trust’s first accessible trails! And, we’ve made it a tradition for our first “Tuesdays on the Trail” event each summer to be an evening of cane pole fishing at Harvest Square. Cell phone, water, and wipes. Plastic bag for leaves or small rocks if you decide on a scavenger hunt. Snacks – lots of them. Picnic lunch and extra water. Bug spray and small first aid kit for scrapes. Magnifying glass to see small treasures. Camera and an extra battery. Favorite hiking stick. Pro-Tip: Mornings on the trail are great – lots of birdsong. Parking: The trailheads all have parking areas. We caution everyone to clear your car of valuables – don’t just put items into the trunk. Don’t want to go solo? 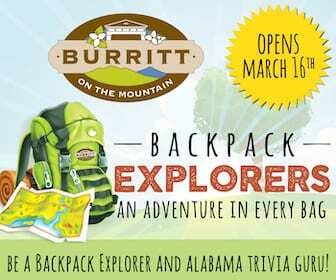 The Land Trust hosts regular Guided Hikes for all ages and experience levels. 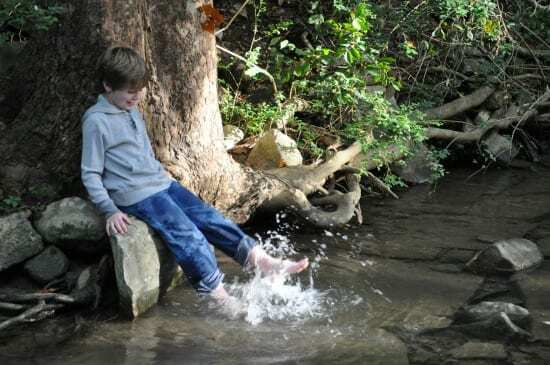 Some of your best childhood memories may be linked to the outdoors: watching big fluffy clouds turn from dragons to donuts; listening to night critter sounds that seemed louder around a campfire; or spinning the magic of big limestone rock slabs into a fort or castle. We encourage you to put your “feet on the ground” and make some special outdoor memories with your family. The Land Trust is honored to open most of our preserved properties for the public to enjoy and to reconnect with nature! Cathie M. Mayne is most often found behind the camera at Land Trust programs. She’s served as Marketing Director since 2003 and is staff liaison with the Environmental Education Committee. She is member of the Girl Scouts of North-Central Alabama Board of Directors and is in the current class of Leadership Huntsville. Daughters Jessie (math teacher) and Emmie (industrial designer and artist) have happily logged many volunteer hours on trails and at Three Caves events. 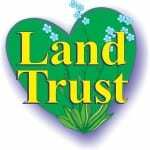 An awesome article promoting the Land Trust and all of its Jewels! Come out to one or many of our events…you will leave with a feeling of “freshness” and have a “relaxed spirit”!